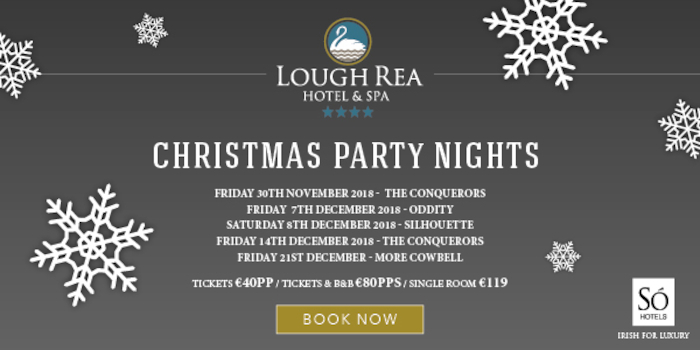 The Lough Rea Hotel and Spa is one of the most highly recommended and well know Christmas party venues in Galway, situated just outside the quaint town of Loughrea overlooking Loughrea Lake. A warm welcome awaits you upon arrival at the hotel. Guests this festive season can enjoy the newest addition to the hotel, the rooftop garden bar and sky lounge, which boasts panoramic views of Loughrea Lake and the Galway countryside. Book your Christmas party on their roof garden and sky lounge for a party with a difference. Packages can be tailored to suit your needs. Space is subject to availability so book early to avoid disappointment. For intimate gatherings to large groups, Lough Rea Hotel has a range of superb options for private dining and parties available during this festive season. Hot cider and nibbles in the piano lounge, 3-course meal with tea and coffee/Live band & Dj tickets just €40 per person. Tickets and B&B for just €80 per person.